For Jextex systems please email kristian@snabb.us to place an order. Looking for the perfect exhaust system for your 2011-2014 C30T5? Look no further. 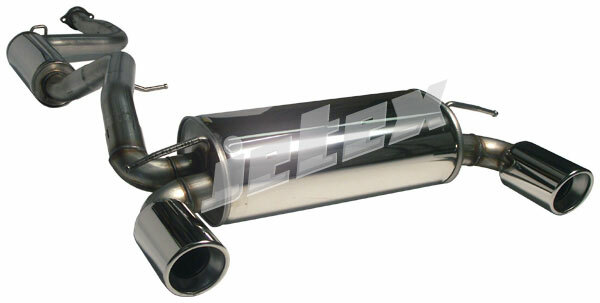 Jetex has decades of experience making exhausts for European cars like your Volvo. They use custom blended stainless steels, offer a lifetime warranty, have great fitment and sound really good without being too loud or expensive. All Jetex systems carried by Snabb Performance Parts are manufactured from either T304 or 409 high grade stainless and are covered with a lifetime warranty for the original purchaser. Each system is a direct fit to the factory OE exhaust system and comes complete with a fitting kit. These great sounding exhaust systems have a subtle deep tone at idle and nice muted grumble at cruise with none of the dreaded 5 cylinder drone but at WOT they sound incredible! The Jetex systems are slightly bigger in bore size and are less restrictive than the standard exhaust therefore are more efficient and help to release approx 10-12% more power! Absorption Design: Sound reduction is a critical design concern with any exhaust system. Standard exhausts use a baffle design where a series of plates slow the exhaust gases, but ultimately this leads to an increase in back pressure. Jetex silencers have no baffles. Instead, noise is reduced by absorption through a centre perforated tube. Consequently, there is less gas flow restriction and so back pressure is reduced, torque is increased and engine performance is enhanced. European Noise Standards: Jetex designs their exhaust systems to maximize performance and adhere to tough european noise standards. This means that you get a great sounding exhaust without it ever being loud or obnoxious. Mandrel Bends: It is essential that gas flow from the engine is unrestricted and flows smoothly along the whole length of the exhaust system. All Jetex bends (where possible) are mandrel bent rather than cut and welded. This ensures that the gas exits as quickly as possible, ensuring back pressure reduction and enhanced engine performance. Rolled Tailpipes: Tailpipes are made from stainless steel, with rolled in ends. Perfect Fittment: Jetex Exhausts are made to fit each specific application. In-house jigs ensure exact replication of the prototype. All systems are supplied with a free fitting kit.